What is the reason for the Sacrament of Confirmation? How is Baptism (and other Sacraments) related to Confirmation? What are some key facts that a Confirmed Catholic needs to know? What are the Gifts and Fruits of the Holy Ghost? What will be expected of me during the Confirmation Mass? 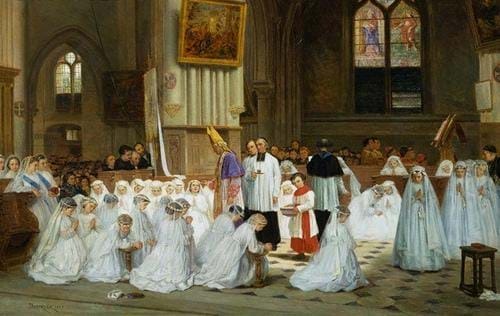 Theophile Duverger, "Confirmation at Villiers Le Bel" 1861. What do I need to know in order to be confirmed in the Catholic Church? How can I best prepare myself to fully understand and appreciate the dynamics occurring in, with, and through this Sacrament of Initiation? The following online lessons will provide answers to many of the questions involved in the ongoing process of becoming a Catholic confirmed in the Faith.